Feast your eyes on this magnificent custom kitchen situated along southeastern Connecticut's shoreline. Completed in 2014, General Woodcraft kitchen designers worked with clients to create this sophisticated and inviting kitchen with traditional coastal roots, elegant custom details and transitional accents. No surprise, it's one of our favorite designsx. 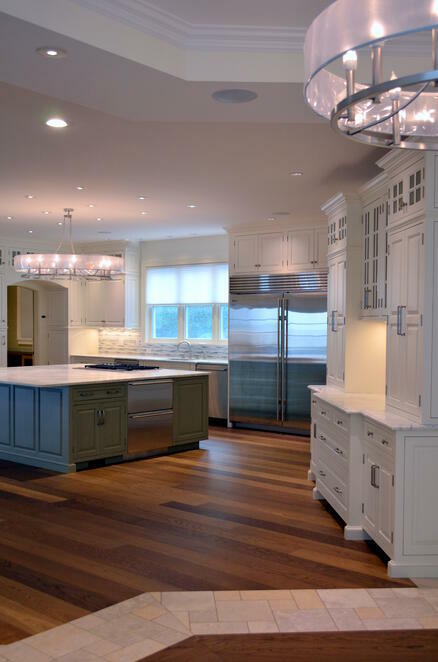 Custom white kitchen cabinetry by Signature Cabinetry features a flush inset raised-panel design, furniture-style baseboards, mullion glass display cabinets and Top Knob hardware in mixed finishes and styles. The over sized custom kitchen island, painted Willow Green and glazed in charcoal is perfect for food preparation and entertaining. Moldings and coffered ceilings by General Woodcraft’s mill-work department create architectural interest and provide continuity throughout the first floor. We love what we do ... and you will too. Custom Moldings and Millwork contact us today.